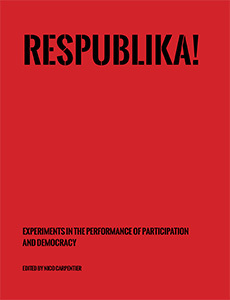 The exhibition at the NeMe Arts Centre consisted of video documentation of previous works and equipment which demonstrated the power of their alternative networks. The work presented was strongly political as it featured aspects of the digital networks that affect us all personally: our privacy, freedoms, but also our imagination and our ability to understand our networks as an integral part of our society’s environment. By counteracting the medial and cultural hegemonies and political rules governing our communication structures and – by revealing the control mechanisms – open up new alternatives in the supranational fabric of the Internet. The tools exhibited are used by communities in the USA, Europe, Australia and activists in countries like Syria, Tunisia, Egypt, Iran, China, and North Korea. We would very much like you to watch these NeMe produced videos uploaded on Vimeo, presenting a talk by Wachter and Jud and the exhibition footage Wachter and Jud, and Open Community - Open Networks. In 2011, we launched qaul.net to explore our expression and communication options in the digital era. qaul.net is an independent open communications network and allows chat, voice calls, file sharing without Internet and mobile phones, directly in a spontaneous network of devices. qaul.net implements a redundant, open communication principle, in which wireless-enabled computers and mobile devices can directly form a spontaneous network. Chat, twitter functions and movie streaming is possible independent of internet and cellular networks. qaul.net can spread like a virus, and an Open Source Community can modify it freely. In a time of communication blackouts in places like Egypt, Burma, and Tibet, and given the large power outages often caused by natural disasters, qaul.net has taken on the challenge of critically examining existing communication pathways while simultaneously exploring new horizons. In September 2014, we received an email from a Chinese activist who wanted to organise an event in the public space in Beijing to which apply regulations and policing control. To circumvent the limitations, his event should take place on another layer to which participants in a wider range could join via their smartphones. qaul.net was extended by a streaming server that allows a mutual sharing of audio messages in an open and independent network. 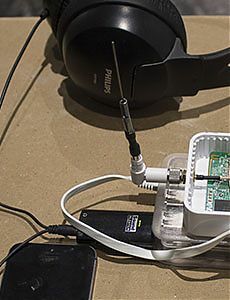 With smartphones, sound be transmitted or received via WiFi connection. About heard, listened to and isolated voices in the digital communication society. Between the US Embassy and the British Embassy, Christoph Wachter and Mathias Jud have designed the art project “Can you hear me?”. Due to the revelations of Edward Snowden, this very place became a political focal point. From there, the British and the Americans were spying on the government and the people in Berlin. Public protests went on without consequences. Instead, oppression became rather widespread. Ironically, the digital media means of expression that were considered, at the beginning of the Egyptian, Tunisian, or Turkish rebellions as promising tools were perverted into their opposite. The digital space which should allow democratic debate is fundamentally manipulated. Because of that, cultural, political, and communicative structures are also shaken and it leads to an experience not unlike the one experienced by people under authoritarian and restrictive regimes, where a gruelling dependence and speechlessness arises. Monitored frequencies in Berlin are used to establish an open mesh network. Messages could be sent to the intelligence agencies on the frequencies that are intercepted by the NSA and GCHQ. Everybody – even the government officials and the officials of the intelligence agencies from the embassies at Pariser Platz – were invited to join the discussion. We have been excited to see what the world has to tell them. Wi-Fi routers today build a very dense network. In most cities, it is common to find more than a dozen strong signals. Connections between portable devices manage to bridge up to 250 metres. This distance can be augmented with sticks, routers and directional antennas such as the simple but effective can antennas. With these antennas and such towers, large distances can be bridged and the network can expand to large areas. Otherwise cut off from the Internet, a neighbourhood network connects an informal settlement in South Paris to the Internet with the help of can antennas and computers, March 2013. Roma families build a gigantic antenna in an informal settlement in order to participate in the WLAN communications network #GLM [Grassroots Local Meshnet], Paris, 2013. The bicycle is equipped with a mini- computer and numerous can antennas. Commands can be sent via a WLAN connection, for example, sending or checking e-mails or downloading music. If the bicycle is near an Internet hotspot, it dials in automatically and the commands are executed. The bicycle connects people in informal settlements with the Internet; Paris, 2013. In 2014, we were invited to Istanbul as well as to the Asian part of the town, south of the Bosporus to give a series of workshops. People started building independent networks and connections on the basis of qaul.net. Together with activists, we developed an extended version of qaul.net, based on their experiences from the Gezi Park protests. This network is accessible for everyone, as a freely available and configurable open source software. Such networks can appear anywhere in manyfold variants and amounts. There is no central logging so to protect users. The independent network remains available even after shut downs of web platforms, mobile services or Internet connections.